Last time I talked about some beginning considerations in replacement skills. Today I want to talk about one of the most common type of replacement skills: communication skills. Functional Communication Training (FCT) is teaching specific communication skills that serve the same function as the challenging behavior. It’s probably one of the most common forms of replacement skills that we use. 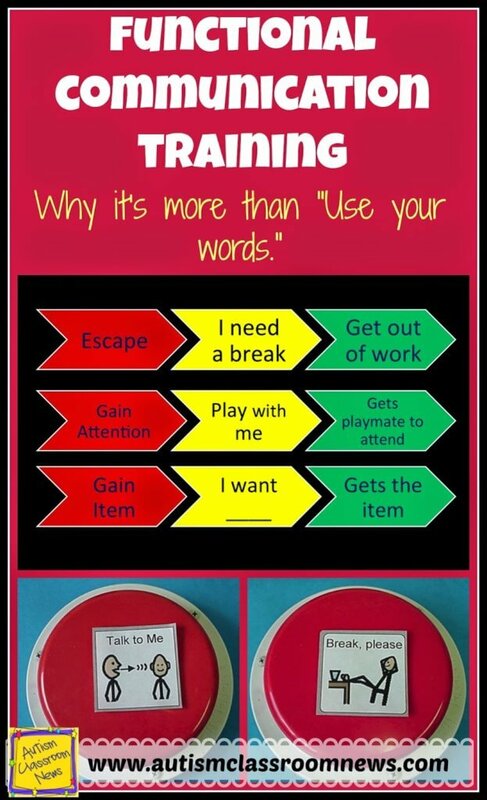 We reference it all the time whenever we tell a student, “Use your words.” However, replacing challenging behavior with communication isn’t as simple as that. If it was as simple as that, we could just redirect and move on and the problem would no longer exist. And repeating “Use your words” multiple times isn’t going to do it either. So what is FCT and how do we use it? Let’s talk about that today. In using FCT, we have to make sure that we follow the guidelines from the last post about teaching replacement skills in general. Quickly, that means making sure that the communication skill serves the same function and that it gets that function more quickly, more easily and more reliably than the challenging behavior. One of the first things we have to think about when choosing a communication form is whether it serves the same function as the challenging behavior. So, if your FBA says your behavior serves to escape from situations, you might teach a student to ask for a break or some other response to get out of the task. You could have him ask for assistance, but that function isn’t quite as direct. You want something that gives you a big “bang for your buck” in terms of addressing the same function as the challenging behavior. If your FBA says the behavior is to gain attention, we need a way to get attention that gets as big a reaction as the negative behavior. In other words, if your face turns purple trying to keep yourself from laughing out loud at something inappropriate, we need a communication response that gets THAT BIG a response for the appropriate behavior. So, for instance, we might teach a student to tell a bunch of jokes that get a big reaction. Or we might teach them to communicate, “Hey look at this!” and show off something they can do and then give them a big reaction. In my next two posts I’m going to talk specifically about teaching a break and teaching those attention-seeking responses. The next question about the communication form is whether it is something the person can already do or is it something we have to teach from the beginning. For instance, does the individual already have appropriate behaviors that get a big reaction or already have a way of saying “finished” or “I don’t want to” but they don’t get the reaction for it that their challenging behavior gets. If he or she already has the skill, it’s just a matter of switching what we reinforce to make sure we reinforce the communication and not the challenging behavior with our reactions. If the individual doesn’t already have the skill, we need to teach the skill. That means we need to choose what form we want to teach, teach it using modeling, prompting and reinforcement just like we teach any other skill, and reinforce it with a 1-1 reinforcer ratio where we provide that reaction each time the student uses the communication. This is an excellent example of when it isn’t going to work to just say “use your words” because the individual has to be taught the “words” whether it’s a verbal or a nonverbal response. Set aside time to teach the skill within the school day. We can try to teach it across the day, but if we are just getting the communication started, we might be better of setting aside a time, like we do for math and reading, to dedicate to teaching the skill. This also allows us to make sure that we can reinforce the behavior consistently at the beginning. We can expand settings as time goes on the skill gets stronger. Understand that the focus of your teaching is that you are teaching the communication response….not necessarily other skills. So, if I have a student whose behavior functions to escape from math, I might set up an instructional time with math work, but my expectation would be that we were going to practice asking for a break (i.e., getting out of math), NOT getting the math done. 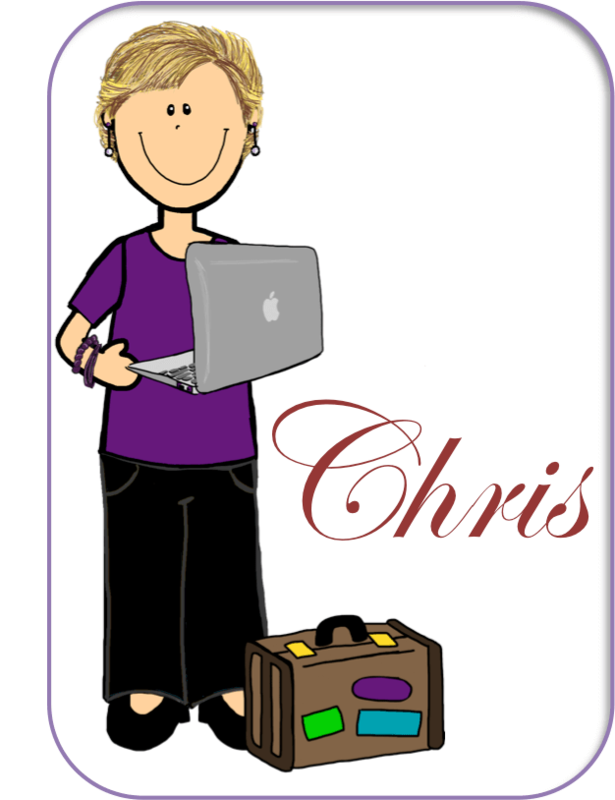 Put the replacement communication skill in the IEP for the student. This helps everyone the team remember that it’s a priority. If you are teaching a student to ask for a break and get out of work, you are actually doing the opposite of teaching the work (e.g., math) itself. So, remember that your instructional focus is increasing asking for a break. The IEP helps to make this clear to everyone. We have to practice the skill over and over and over and over….you get the idea. Just like we use repetition in teaching academic skills, we have to have repetition in make requests for breaks or attention. We also are trying to change a habit. The habit is to use the challenging behavior to get out of the situation or get attention. Changing a habit is going to take more practice and more consistency than just teaching a new behavior. Think how long it took you to break yourself of a habit like biting your nails or tossing your keys anywhere in the house instead of putting them on the hook where you can find them. One of the keys to making FCT work is to make the behavior really inefficient at getting the function met. We make the communication form really efficient–gets it fast, easily, and consistently. We create a similar condition where we try to make the challenging behavior really slow at getting reinforcement, where the individual has to work extra hard to get reinforced with the challenging behavior and where it doesn’t pay off as often or as consistently. To some degree this means we ignore it or doing let the person out of the situation as much as possible. However, there is some research that indicates that we don’t have to use perfect extinction processes (withholding reinforcement every single time), we just have to delay the reinforcement and make it less consistent. This gives us an “out” when we need to intervene for safety. After the challenging behavior has significantly decreased in frequency AND the individual is INDEPENDENTLY communicating for the function, then we can start to slowly build in work demands (e.g., do one more then we’ll take a break or wait 5 seconds and then I can talk to you). However, if we do this too soon, we’ll lose the progress we have made. So, start slowly and with very small amounts. And remember that if the person asked for a break (or attention) and you asked him to wait, HE DOESN’T HAVE TO ASK AGAIN. You don’t want to essentially extinguish the communication response because you make him ask more than once. You made a deal that this communication response will get his needs met…you have to keep up your end of the bargain and reinforce it even when we start delaying that reinforcer. So, there is so much more that goes into FCT, but by essentially teaching communication responses that serve the function of the behavior, we give the person a life-long skill that can serve to improve quality of life without the need for challenging behavior. In the next couple of posts I will share some tips on teaching a break response and in teaching attention-seeking communication. In the meantime, the resources below (Amazon Affiliate links) might be helpful if you want more information. Thank you, thank you! I have loved this series to give teachers some background in specific aba skills and under-pinnings. The SLP in me loved this post. While I have always had a little bit of an issue with the term itself (I once challenged Ted Carr to tell me what exactly a non-functional communication was LOL) I still use it, of course. I can only imagine Ted's response to that, Susan! I miss him! He was my mentor! I agree that the name is confusing because it doesn't mean the same thing as functional communication for SLPs, but I do like the emphasis of function (in both uses actually). Thanks for reading and commenting! !